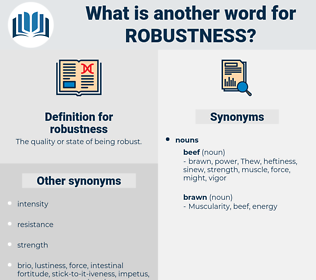 What is another word for robustness? 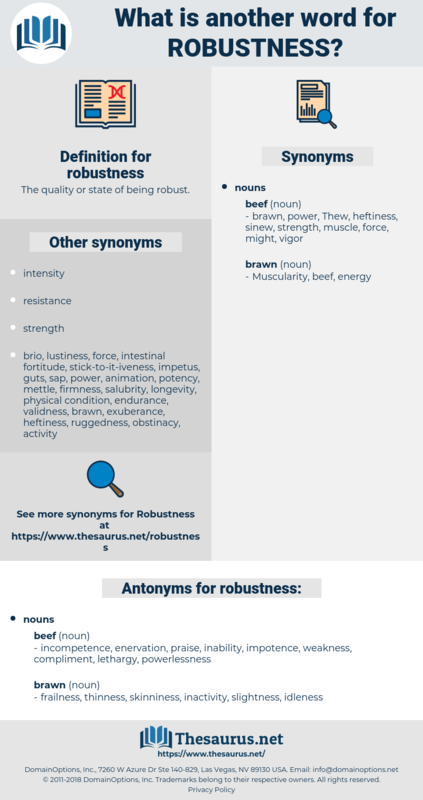 The quality or state of being robust. stamina, cheers, stability, resistance, steadfastness, vigour, thoroughness, consistency, integrity, validity, rigour, tenacity, assertiveness. resilience, toughness, reliability, firmness, trustworthiness, dependability, sustainability, durability, Defensibility, resiliency, fortress, fortitude, vigor. incompetence, enervation, praise, inability, impotence, weakness, compliment, lethargy, powerlessness. frailness, thinness, skinniness, inactivity, slightness, idleness. indifference, timidity, laziness, yielding, discouragement, death, coolness. limpness, debility, vapidness, spiritlessness, listlessness, decrepitude, condition, tedium, weariness, unsoundness, ailment, trouble, languidness, unhealthiness, torpor, vapidity, languor, dullness, anemia, disorder, malady, torpidity, impassivity, lifelessness, sleepiness, lameness, pallidness, sluggishness, apathy, feebleness, indolence, tediousness. His robustness, his wit, his reverence for established things, his secret piety are all contributory causes; but the chief of all causes is that the proportion in which these things were mixed is congenial to the British mind. When they were seated at the table under the laurel - trees before the Buon Pesche, Lawrence threw himself into the situation, with all the robustness of a moral resolve to do the delightful and sinful thing.